I picked up a book called Rand McNally I Know About Flags several months ago thinking it would be good for Juliet in a few years. She surprised me by being really interested in it already. If you look inside, you can see how appealing it is–bright, colorful, and accessible to young children. 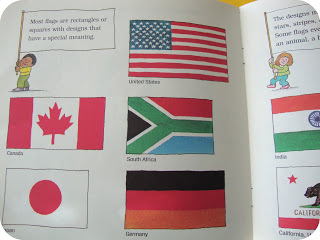 The book is only meant to serve as an introduction to the concept of flags, so it does not contain ALL the flags of the world. (Yours might not be in there!) Some are state flags, some pages are dedicated to sports teams’ flags, nautical flags, etc.The trades get generated by the robotic trading software in a unique format. This format uses binary coding where the software starts to give trading signals.This website lets you know that how the predictions for the trade movement are given. This is done to know if the price of the asset is likely to rise or fall in the future. But the majority of it features country flags. We don’t always read the text, mostly we just point out the flags and talk about each. 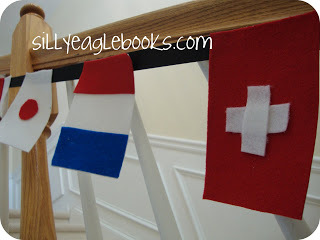 I wanted to make a set of felt flags for Juliet to play with and to decorate our home with (all the Valentines stuff is packed away!) 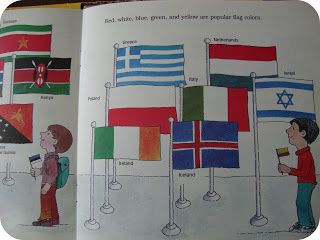 In my mind, I dreamed of making all the flags of countries we know people living in and ones we have visited or read about. Here’s what I mean. 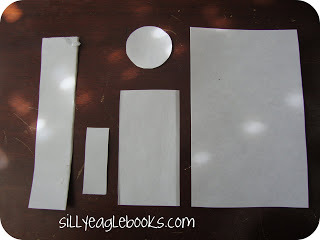 One large rectangle. Two small rectangles. Glue. Oh, I should mention, that I did make one exception and cut out a quasi-maple leaf shape in order to make the Canadian flag. I figured I couldn’t leave it out since it is the host country for the winter games this year! This site has a nice list of all the flags in alphabetical order. I just clicked through and found ones with rectangles and circles that I could copy. 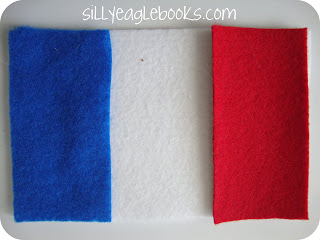 You could print the flags instead of making them out of felt or paper, but I didn’t want to use up that much ink. This site is awesome! 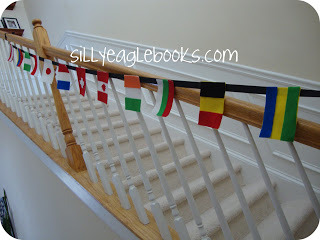 You can print out 3 different sizes for each flag–small, medium, or large. 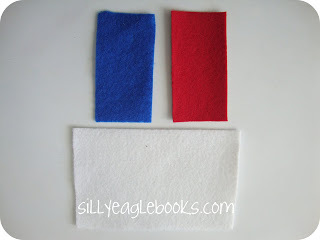 Then you can use them as a coloring sheet or as a pattern if you want to get fancy with your felt flags. If I wanted to make a more complicated one, I could have printed it out and cut it into pieces to use as a template. 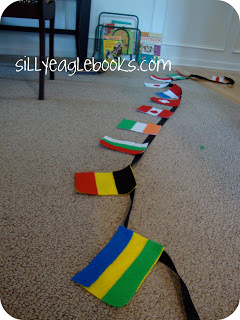 Do you have any good flag books or projects to share? I’m linking this post up to Feed Me Books Friday!